Spring brings with it a sense of renewal and fresh growth, but we can't all enjoy the luxury of an expansive outdoor gardening space. For those of us in small and urban spaces, growing your own indoor garden can be a wonderful way to bring the feeling of spring into the home. Try any of the great kits we've put together here and don't forget some of the tools you'll need along the way. 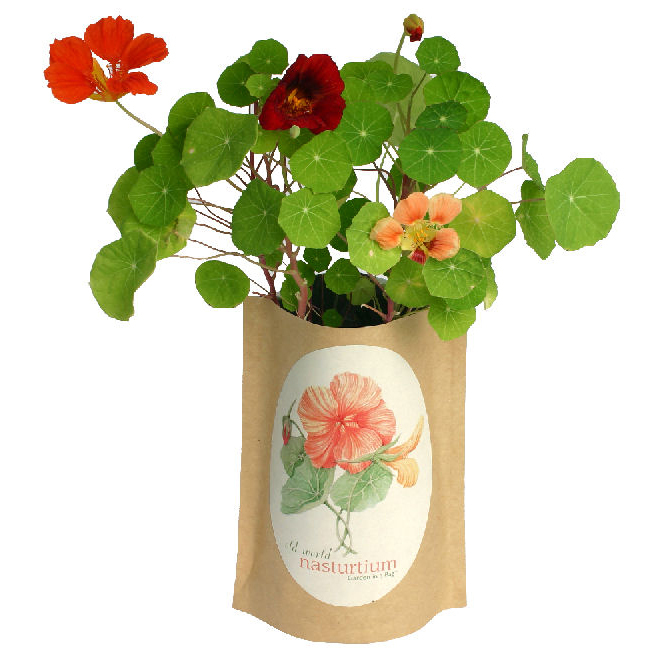 The earth-friendly Potting Shed Creation produces leak-free paper bags full of soil; space-challenged gardeners simply have to add the enclosed packet of seeds and keep everything watered regularly in order to enjoy fresh produce. Depending on the size of your windowsills or countertops, it’s possible to have a whole garden arrayed in brown paper bags—from basil to alpine strawberries. If you want a row of pots on the windowsill but are afraid to plant because of a busy schedule and a tendency to forget the required watering, these pots are the perfect solution. Tiny nylon threads extend from the pot into a water reservoir below, helping extend roots’ reach and thus giving chives or tomatoes at least a week’s worth of water. It only takes about four days to start seeing the first shades of green sprouting from these Haute Culture mini gardens by French brand Racine Carré. Grow grass, basil or peas in three different sizes of sleek acrylic boxes and watch as your indoor garden begins to bloom. Available in the US from A+R Store. Everything you need to grow organic basil—soil, seeds, planter. The real bamboo planter works as the grow pot and the top of the container is the saucer. Brilliant! Gravity gets this indoor watering can flowing—hold the silicone tube down to water and up to stop—and magnets conveniently hold the hose in place for storage. Some indoor plants need a light mist every now and then, in addition to watering due to dry indoor air. Give your greens a little spritz with this sleek metal sprayer.